This week we take a closer look at the importance of Creating a Plan, which is the first of the three key areas firms need to consider when answering the questions above to ensure a successful and sustainable digital transformation. Courtney Troutman, Director of the South Carolina Bar Practice Management Assistance Program, believes that fear of the unknown is one of the main reasons firms hesitate to adopt technology. She and other practice management technology pros share their tips on making the transition to the cloud in a recent Attorney at Work article. Having a well-outlined plan can help overcome the arguments and demonstrate the advantages of leveraging technology to streamline transaction workflow processes. Below are four critical steps that should be considered when building a sustainable adoption plan to master the deal management process by utilizing a transaction workflow management solution. Transaction management software promises significant benefits to law firms and their clients. Some of these benefits include improving operational efficiency to save time performing administrative tasks and standardizing project management processes to increasing productivity. However, even with these reported benefits, the level of overall success for technology adoption has oftentimes been questioned. One notable reason for this adoption failure is the lack of an organization’s ability to properly align the benefits software solutions provide to actual value-driven business objectives that impact long-term success. Some examples of value-based business objectives are increasing realization rates, improving the client experience, or leveraging data to track and analyze firm performance data to make informed decisions around staff capacity or business development opportunities. Defining your desired business objectives is a critical first step in the planning process so that you have clarity on what your end goal is and how the project will impact the organization. Secondly, identifying how you will measure and track success will ensure that you have a way to monitor progress so you can modify your plan should you run into unforeseen challenges in meeting your objectives. Having a way to demonstrate and share your success will also build buy in at the Partner and Executive level. Another important step in the planning process is having a good understanding of your existing processes so that you can identify gaps and focus on areas where the biggest improvements are needed. Understanding your existing processes allows you the opportunity to create a baseline for where you are today and a roadmap for where you want to be in 1 month, 6 months or 1 year. It will also help you define a list of requirements that you will need in evaluating technology solutions to make sure the technology solution meets your unique needs. Frequently firms have disparate processes across the organization, possibly even using different types of technology solutions with overlapping functionality. Assessing your existing processes and current solutions will ensure you get the most effective use of your technology and maximize the value of your investment. Most technology vendors provide an implementation plan to assist you in launching technology solutions as quickly and efficiently as possible, however, it is important to think beyond the implementation process and build a strategy of your own on how you will increase adoption long-term and achieve your overall business objectives. Assigning a project manager and starting with a small focused group before rolling a solution out to a broader user community allows you to work out any internal processes and challenges ahead of time. This is also a great time to document a standard process and develop best practices so you can get all users aligned to accelerate success and decrease the time it takes to onboard new users. The last and most overlooked step in the planning process is tracking and monitoring key performance indicators (KPIs) for continuous improvement. Today’s software solutions provide you with standard usage reports that are important in helping you track user activity. This insight can be extremely important to the project leaders in understanding how well the product is being used throughout the organization and how often. Although usage data is important, it is just the tip of the data iceberg. A huge benefit of utilizing technology solutions is the opportunity to collect data points that you wouldn’t have if you weren’t using technology and to use that data to make informed decisions. 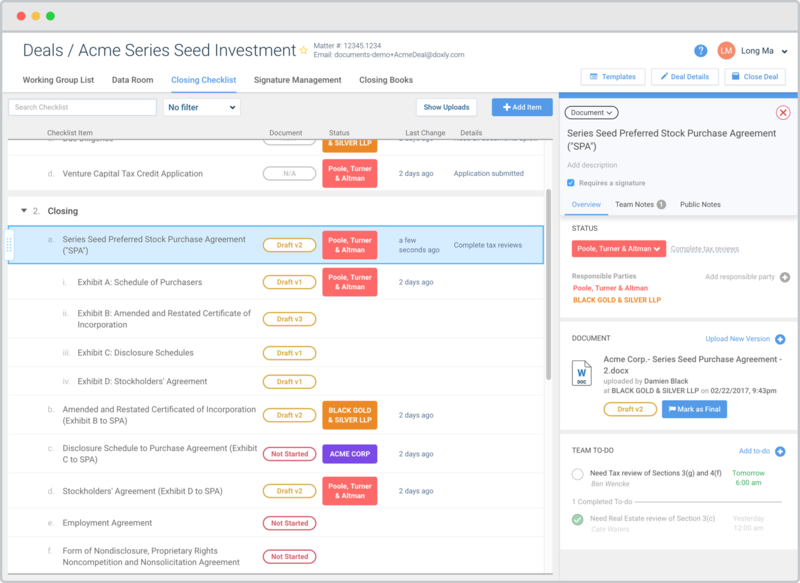 In the coming weeks, we will spend more time diving deeper into the specifics of how to enhance workflows during the closing process, specifically standardizing the closing checklist, automating signature management, and simplifying the closing books process. We will also provide examples of data elements that are important to track in order to demonstrate success in achieving your value-based business outcomes and truly master the deal closing process.